Notice: BPI Mobile Banking currently unavailable. BPI’s mobile banking facility through USSD *119#, allows BPI account holders to do banking transactions such as check account balance, perform fund transfers, reload prepaid, or load their GCASH wallet using their mobile phones. Here’s how to use BPI Express Mobile via USSD *119# on your Globe/TM cellphone. BPIMobile will send a text message upon successful MPIN change. Now, you are ready to use BPI Express Mobile! BPI to GCash Transfer. Transaction fee is Php 1.00 to be deducted from your BPI account. If you want to transfer Php 8,000 to your GCash wallet, you will be charged Php 8,001 from your BPI account. 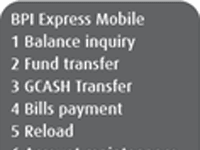 GCash to BPI Transfer. Transaction fee is Php 20 (to be deducted from your BPI account). If you want to transfer Php 8,000 to your BPI account, the transaction fee would be Php 20, therefore you will be debited Php 8,000 from GCash and Php 20 from your BPI account. For other transactions, visit BPI Express Mobile. how to update mobile number? Gcash Transfer option is not showing on your BPI app And my BPI account is linked to GCash. *119# will be disabled in November.